Ali Carter booked a quarter-final tie against Peter Ebdon following a surprise 13-4 win over 2005 champion Shaun Murphy at The Crucible. The Essex player, 28, held a 12-4 lead going into the final session and took less than 30 minutes to win the 17th frame and secure victory. In Saturday's early session, Carter won the first two frames to make it 8-2 before Murphy made 60 to win the 11th. Three 50-plus breaks helped Carter to 12-3, while Murphy clinched the 16th. Murphy, who was one of the favourites for this year's title, has reached the semi-finals or better in six of his last seven events, but that consistency was nowhere to be seen in a dismal display. 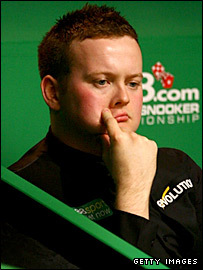 However, the champion of two years ago joined John Higgins in criticising the state of the snooker tables. "We have a gambling sponsor, why don't we take the championship to a casino and have a real game of chance?" said Murphy. "This is the world championship, the gala event we all look forward to. Yes, I'll hold my hands up, I missed some shots I shouldn't have but there were a lot of problems out there that cost me the match. "It's not just me and John Higgins having a problem with it and it's not just because we lost. It will look like sour grapes but it's not and it will cost other players. "The comments have been made backstage for days. The cloth is so thin and light it's only good for three days' play. "After three days you get bad bounces and balls going where they shouldn't be and it makes a mockery of the biggest tournament we've got. "I filled a complaint form out immediately after my first round match. The cloth is made very well but it needs to be changed after every round." Meanwhile, victor Carter said he was content with the condtions. "I thought the table was playing OK," said the 28-year-old. "I got a few bounces but I am playing on the same table as Shaun. It can cost you if you get a ping off the cushion but it's the same for both of us. "It's not the best conditions there has ever been but it's not the worst."